Set in a lush landscape, the thirty suites of Heritage Le Telfair harmoniously combine ample space and optimal comfort. To ensure guests a totally serene stay on the Domaine de Bel Ombre, each suite comes with a customised butler service. Heritage Le Telfair provides butler services to suite residents. With much attention to details as to their clients’ needs, butlers strive to make their stay more enjoyable. They diligently cater to their every wish and need, from check-in to check-out. As dedicated companions, butlers anticipate their guests’ expectations and make every possible effort to provide them with a unique and unforgettable experience. The butler cautiously sees to residents’ well-being on a day-to-day basis. He prepares their arrival and welcomes them, making sure they receive top-class service. In-room breakfast, satisfaction of each guest’s expectation, booking and arrangement for excursions and activities… He is the holiday-planner and dedicated correspondent of the hotel’s guests. Making special arrangements is also part of his daily duties. For instance, he can set up a daily tea break to meet clients’ habits, arrange a visit of the Domaine at their arrival or organise a surprise dinner for two on the beach. Nothing is too good for Heritage Le Telfair’s guests! Butler service is in line with the hotel’s philosophy, which is yesteryear’s gentle way of life. 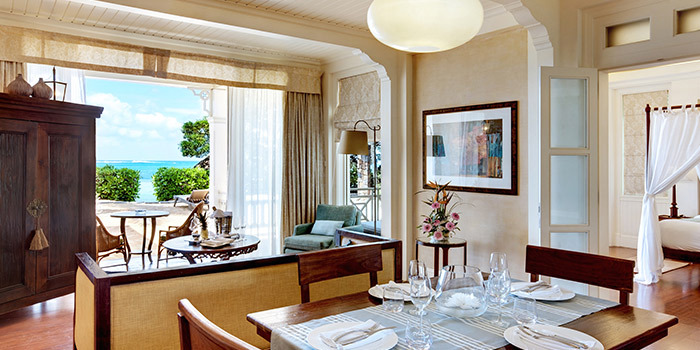 Heritage Le Telfair actually carries its guests back in the olden day Mauritius for a truly authentic experience! Spacious and comfortable, the hotel suites offer a subtle blend of tradition and modernity. 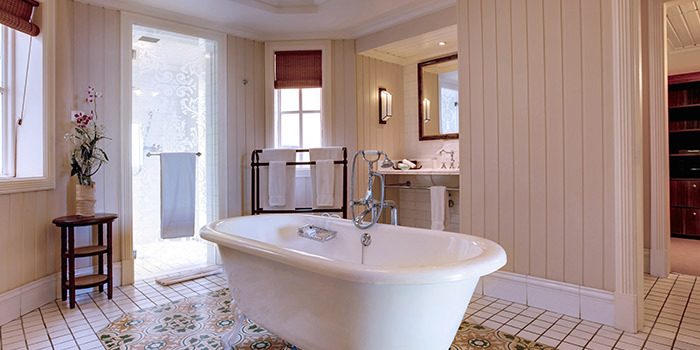 Heritage Le Telfair actually welcomes guests in an elegant and refined décor reminiscent of 19th-century colonial houses. French windows open onto a veranda or a balcony for splendid views of the lagoon or the river. Optimal comfort awaits guests inside the suites: interactive TV, espresso machine, iPod dock station, free wireless connection, spacious dressing room, separate shower, communicating rooms… and, of course, a 24-hour butler service! In a word, this is a convivial accommodation, perfect for families and couples alike. Nestling in a splendid natural landscape between the ocean and a nature reserve, this luxury hotel pays tribute to the man behind the Domaine de Bel Ombre. The Irish botanist and naturalist, Charles Edward Telfair, and his wife, Annabella – whose name has been given to the hotel’s main restaurant – played an instrumental role in the development of the Domaine de Bel Ombre, where they lived in the 19th century. Heritage Awali invites guests to choose the All Inclusive Premium package and enjoy amazing benefits during their stay. Such benefits apply to gourmet offers, sports activities and wellness options on the Domaine de Bel Ombre, as well as special care to babies, kids and teens. Once they have left their children at the Baby Timomo Club, where they will be looked after by a team of six qualified and first-aid certified nurses from 8.30 to 16.30, parents are free to make the most of their All Inclusive Premium package: culinary treats, wellness or sports, according to their mood. Heritage Awali’s wellness offers include a free 45-minute back massage at the Seven Colours Spa, free access to the spa and Umuzi fitness centre (cardio, aerobics, etc.) along with the hotel’s aquagym and yoga courses. Those looking for adrenaline-charged vacations have no reason to worry: there is something for sports lovers too! Hotel residents can actually benefit from one daily free green fee on Heritage Golf Club’s famous 18-hole championship golf course (PAR 72) and unlimited green fees on the 9-hole initiation course (PAR 3). Other activities are included in the All Inclusive package, such as tennis, archery, mountain biking, volleyball and a wide range of water sports – windsurfing, kayak, waterski, glass-bottom boat trips and more. The most tempting items of this All Inclusive package are exclusive additions for a unique experience, such as a quad-bike tour in Fréderica Nature Reserve, an open-air dinner at the African restaurant BOMA, a special lobster dinner at Infinity Blue, one spa treatment per adult and per night stay (except on arrival and departure days) to choose from a selection of Seven Colours’ 45-minute treatments… A whole interesting benefit package it would be regretful to leave out! 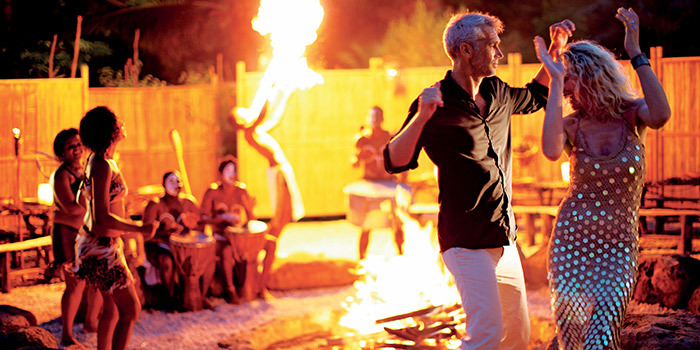 In addition to a wide array of activities to enjoy, the All Inclusive Premium package has something to please fine palates and guests looking to experience the culinary diversity Heritage Resorts offers in connection to the Domaine de Bel Ombre. Guests are treated to a range of in-room benefits, including free 24-hour room service to grab a bite at any time of the day, free tea and coffee, an espresso-maker and a minibar, which is replenished once daily with selected standard and local drinks. Moreover, a selection of our finest restaurants welcome All Inclusive Premium guests with a selection of breakfast, lunch and dinner options to satisfy every taste. Finally, guests can enjoy little extras like a sundowner cocktail, tea and coffee served with cake and pancakes all through the afternoon, and a picnic basket offered for excursions. What could make holidays more tasteful! 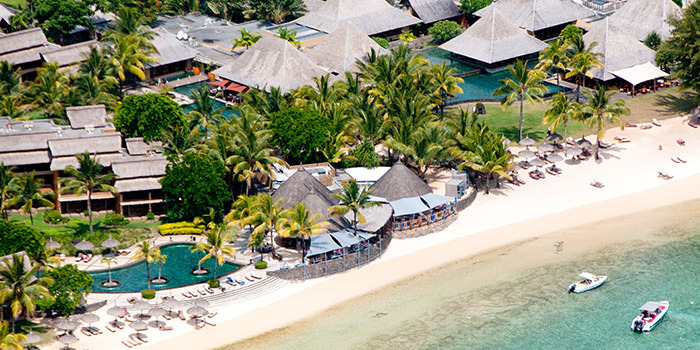 Heritage Awali is a 5-star hotel located off the southern coast of the island, on the Domaine de Bel Ombre. The superb turquoise lagoon and bordering natural reserve make it a prime location for an ultimate change of scene and exciting holidays!